[editors note: The Clarke Historical Library staff would like to wish you and your family a Happy Thanksgiving. Because of the holiday, we will be closed Thursday, November 22 through Sunday, November 25. We will open with our regular hours on Monday, November 26. Today, November 21, marks the 100th anniversary of the final departure of the Rouse Simmons, also known as the "Christmas Tree Ship." The Rouse Simmons was a Lake Michigan vessel that was most noted for being loaded with freshly cut Christmas trees to be delivered to the city of Chicago in November and December each year. At the time of her maiden voyage on September 4, 1886, her original purpose was not to haul Christmas trees, but to be used as a lumber boat traveling between Manistee, Michigan and Chicago. In the 1890s, the Rouse Simmons began an annual journey from Michigan laden with Christmas trees for the Chicago market. 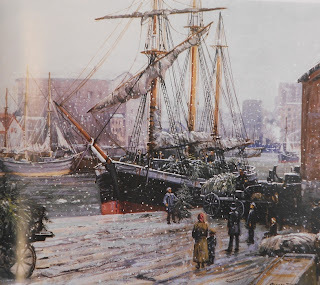 As the years passed, the schooner was re-purposed to transport iron and copper ores, lumber, piling, and rough stock of all descriptions, but the annual voyage with Christmas trees was always part of her program. The Captain of “Chicago’s Christmas Tree Ship” was Herman Schuenemann. For his part in transporting the cargo, Schuenemann was known as Captain Santa. On the 21st of November of 1912, the Rouse Simmons left Thompson, Michigan, near Manistee on its final voyage. A particularly violent storm had blown across Lake Michigan during the trip. On November 23, the Rouse Simmons was last seen flying a distress signal near Twin River Point and Kewaunee, Wisconsin -- an area “long [...] considered one of the most dangerous portions of the Lake.” During the first week of December, 1912 news reports found in several Michigan newspapers noted that the ship had gone missing and that the haul of the ship - Christmas trees - had been washing up on shore in Kewaunee, Two Rivers, and Sturgeon Bay, Wisconsin and Pentwater, Michigan. The Rouse Simmons, along with Captain Schuenemann and the fifteen members of the crew, went down, most likely on November 23, 1912. The story of the fateful journey of the "Christmas Tree Ship" is documented in the newspaper and book collections of the Clarke Historical Library, particularly The historic Christmas tree ship and The Christmas Tree Ship: the story of Captain Santa, both by Rochelle Pennington. 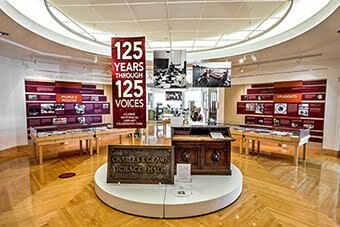 Discover Michigan's maritime past at the Clarke Historical Library.